This article, I feel, would only be muddled if I tried to talk up its significance in the world of Disney. So, without further ado, straight from the Winter 83/84 Disney News, written by Leonard Maltin, The Carl Barks Story: The Creator of Scrooge McDucks Moves Into the Limelight. Who is the most widely read contemporary author in the world? James Michener? Robert Ludlum? Guess again. Who is the most popular artist in the world? Picasso? LeRoy Neiman? Andy Warhol? This may come as a surprise, but the most popular and widely read artist-writer in the world – by at least one educated estimate – is a man whom most people have never heard: Carl Barks. You see, Carl Barks was the author and artist responsible for many of Walt Disney’s Donald Duck comic books for more than 20 years (and the creator of the immortal character Scrooge McDuck). Although he retired ten years ago, reprinted editions of his stories are still read by approximately 22 million people every month, all around the world. Bark’s obscurity is easy to explain: his name never appeared on any of his work – because artist and writers weren’t credited on most comic books. Barks himself was content to work in anonymity for many, many years. Then, in the 1960s, as comic book “fandom” spread throughout the land, a few knowledgeable buffs learned the identity of the man behind the most fanciful stories – and flavorful drawings – in those Disney conic monthlies. Just as Barks was easing into retirement, he began to receive fan letter and invitations to appear at comic collectors’ conventions. 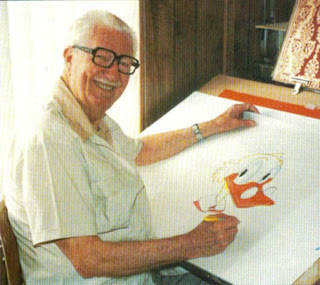 In 1971, with a much-reduced work schedule, Barks had some free time and agreed to do an oil painting for one fan who longed for an “original” of his favorite Uncle Scrooge comic book cover. Although he’d never painted seriously before in his life, Barks rose to the challenge – with the help of his wife, Gare, herself a talented artist. He copied the original cover, but decided to paint the ducks in a realistic, three-dimensional style; the effect was startling, but the fan who commissioned the painting was delighted and paid Barks the agreed-upon sum of$150 for his work. Word got around that barks was willing to do these paintings, he began receiving other commissions and soon had more than he could fill. The price began to jump as well. By the time he stopped painting the Ducks in oil, in 1976, Carl had finished 122 separate works – and in the years since then, some of these paintings have been resold for as much as $60,000. Not bad for a little-known artist who, until his 70th birthday, had never tried an oil painting. The Fine Art of Walt Disney’s Donald Duck is an even more limited run (1,875 books, also nearly sold out), priced at $200 with reproductions of all 122 Barks oil paintings, along with a biographical easy and the “lineage” of each portrait. And Carl Barks and the Art of the Comic Book is a full-fledge book-length study of the Master by a longtime devotee, Michael Barrier. If this strikes some people as mere hyperbole, all doubt should be erased by an examination of the artist’s vintage work. In “Land beneath the Ground,” Uncle Scrooge begins to worry that his money vault – the size of an entire city block – could be threatened by earthquakes. With “five billion quintuplatillion umptuplatillion multuplatillion impossibidillion fantasticaltrillion dollars” at stake, he hires a crew to dig underground in search of fault lines, but those professionals are scared away by the sound of strange voices. Inevitably, Donald Duck and his nephews (Huey, Dewey, and Louie) follow Scrooge into the mine shaft to see what’s up – and discover a strange race living miles underground. These goonlike creatures “roll around like balled-up armadillos and talk like movie cowboys,” and call themselves Terries and Fermies. Their main sport in life is causing earthquakes, which they do in constant competition. Their next target: a pillar that is the main support of Duckburg! What storyteller of old could improve upon that for sheer imagination? And how many could complement the basic idea with vivid, funny and often extraordinary drawings? This is what makes Carl Barks so special. He poured his heart and soul into every comic book, and it showed. His work-and-picture canvas was the 28-page comic book story. No one used this format more wonderfully than he. In a recent talk with the artist and his wife, this longtime fan learned just how much thought – and hard work – went into each of Barks’s comic creations. It all began with the story, written in longhand on pads of legal-size paper. Barks is uncharacteristically modest about his drawing ability (“I had so little experience, I was just feeling my way all the time”), but he takes great pride in his ability as a storyteller – and story planner. After breaking down his story into panels – and miniclimaxes – Barks would spend a tremendous amount of time sharpening the dialogue that appeard in the comic-strip balloons. The one thing about Barks was that he was never pretentious. He’s lived a simple life these 80-odd years – and has just moved back to the state of his birth, Oregon, after many decades in California. He had no particular training for the profession that has brought him latter-day fame. He spent his early years working on farms, ranches, in railroad repair yards, and in a box factory. But something drew him (pun intended) to the field of cartooning, and after a correspondence-school course, he decided to try his luck selling magazine cartoons full-time. In 1935 he went to work for the Walt Disney studio, where he found his niche not as a cartoonist – but as a gag man, specializing in Donald Duck. He was never cut out to be a cog in such a giant wheel, however, and the solitariness of cartooning held appeal for him. So in 1943 he did his first work on a Disney comic book, and before long he was writing and drawing the leading Disney comics – unwittingly influencing a generation of wide-eyed fans. Though he never minded the anonymity of comic books during his 30-year career in the field, Barks enjoys the adulation that is now coming his way. What a great article - thank you for posting it in its entirety! I love anything and everything to do with Scrooge McDuck...of course, I am a little biased.